The constitutional Rights of the indigenous peoples are expressed in a specific chapter of the Constitution of 1988 (title VIII, "Of the Social Order ", chapter VIII, "of the indigenous peoples"), aside from other regulations throughout the text and an article of the Acts of the Transitory Constitutional Regulations. This deals with the Rights marked by at least two innovative and important concepts in relation to prior Constitutions and the so-called The Indian Statute. The first innovation is the abandonment of the assimilationist point of view, which considered the indigenous peoples as a transitory social category, destined to disappear. The second innovation is that the rights of the indigenous peoples over their lands are defined in the concept of original rights that are prior to the creation of the State itself. This is a result of the de facto historical recognition that the indigenous peoples were the first occupants of Brazil. The new Constitution establishes, in this manner, a new outlook for the relations between the State, Brazilian society and the indigenous peoples. It is recognized that the indigenous peoples have the right to their social organization, customs, languages, beliefs and traditions, and their original rights over the lands that they have traditionally occupied, it being the duty of the federal government to demarcate these lands, protect them and ensure that all their properties and assets are respected”. Note that the right to be different does not imply fewer rights or privileges because the Constitution of 1988 assured indigenous peoples the right to use their languages and own processes for education at the primary school level (Article 210, § 2º), thus inaugurating a new phase for the implementation of indigenous grade school education. Furthermore, the Constitution allows the indigenous peoples, their communities and organizations, just as any individual or corporate entity in Brazil, the right to file suit in court in the defense of their rights and interests. Davi Yanomami (a esquerda), presidente da Hutukara Associação Yanomami e funcionário da Funai na manifestação para retirada dos fazendeiros da região do Ajarani, Terra Indígena Yanomami, Roraima. The new Constitution was innovative in every sense, establishing above all that the Rights of the Indians to the lands they traditionally occupy are of an original nature, in the sense that they are original to the land, prior to the formation of the Brazilian state or government, existing independently of any official recognition. Lands traditionally occupied by the Indians are those that they have inhabited permanently, used for their productive activity, their welfare and necessary for their cultural and physical reproduction, according to their uses, customs and traditions." it is prohibited to remove the Indians from their lands, except in exceptional and temporary conditions, as stipulated in § 6º - Article 231. In the Transitory Constitutional regulation, five years was stipulated as the time frame for the demarcation of all the indigenous lands . This deadline was not honored, and the demarcations are still a matter that is still pending. The state must protect the manifestations of popular cultures, including those of indigenous peoples. The Constitution of 88 created the need to set up a review via ordinary legislation and the inclusion of new themes in the juridical debate about the indigenous communities. Beginning in1991, law bills were presented by the executive branch of the government and by deputies to regulate the constitutional clauses and adapt the old legislation based on the principles of the integration of the indigenous communities in the national community and the tutorial relationship between the government and the indigenous groups to the terms of the new Constitution. Thus, the legal basis in support of the most fundamental claims of the Indians in Brazil was formulated by the new Constitution and has been currently expanded and rearranged. 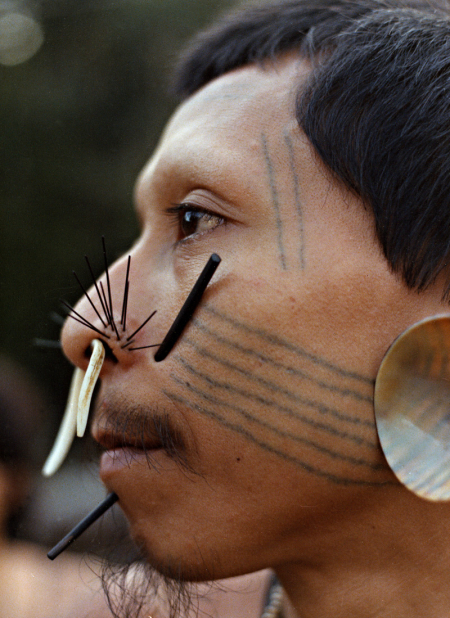 However, Brazilian reality shows that it is up to the indigenous communities and their allies to make it possible to enforce the difficult task of making the laws complied with, guaranteeing the respect of indigenous rights in practice, in the face of many different economic interest that had the audacity to ignore the existence of these rights. "Art. 129 – The possession and occupation and rights to the land of the indigenous communities where they are permanently located will be respected, and it is prohibited to sell or encumber their rights to the land in any way, shape or form." "Art. 154 –The possession and occupation and rights to the land of the indigenous communities where they are permanently located will be respected, and it is prohibited to sell or encumber their rights to the land in any way, shape or form." "Art. 216 – The possession and occupation and rights to the land of the indigenous communities where they are permanently located will be respected, on the condition that they do not transfer their rights to the land." "Art. 198 – The lands inhabited by the indigenous communities cannot be encumbered or transferred in the terms that the federal law specifies, The possession and occupation and rights to the land of the indigenous communities where they are permanently located is recognized, as well as their exclusive rights to the utilization of the natural resources and all the utilities existing therein.". This page was last edited on 24 January 2018, at 16:39.